(CNN) - Jeb Bush and Hillary Clinton - two central figures in modern politics with 2016 prospects - joined forces Monday to talk global education. In her keynote address, Clinton praised Bush's dedication to education reform since serving two terms as governor of Florida, where he overhauled the state's education system, introducing a school voucher program and banning using race as a factor in university admissions. The Globalization of Higher Education conference in Irving, Texas, hosted by Bush and former North Carolina Gov. Jim Hunt, was aimed at exploring the link between globalization and post-secondary education. A source familiar with the event told CNN that Bush and Clinton said hello to each other and had a brief exchange. It's the latest in a series of events where the two potential presidential candidates from opposing parties have rubbed shoulders. They also both attended a presidential library dedication in April for Jeb Bush's brother, former President George W. Bush, in Dallas. And at a Philadelphia event last September, Bush awarded Clinton the Liberty Medal in his role as chairman of the National Constitution Center. Clinton, the former secretary of state, first lady and senator from New York, is fresh off a three-day weekend of speeches, panels, and seminars hosted by the Clinton Global Initiative to address higher education and other issues facing young voters. Her speech Monday focused on developing global partnerships with colleges and universities to appropriately tailor and deliver education resources around the world. Education, Clinton said, "...is one of the most valuable assets that the United States has. It's something that we have to continue to invest in, to protect and indeed to share with the rest of the world." In his opening remarks, Bush pushed for the use of technology to expand access to education. "Utilizing technology to explore post-secondary education into rapidly emerging markets can become a principle platform for realizing the pent-up value of U.S. grants and can bring a sustainable economic model to American universities," he said. Both politicians have amped up their public appearances recently, further stirring speculation around the prospects of a potential Bush-Clinton 2016 presidential showdown. Clinton has said that she'll decide by the end of the year whether she makes a second run for the White House. Bush has given a similar timeline for his decision. A CNN/ORC International survey conducted from March 7-9 indicated Bush in fifth place in the race for his party's nomination among a list of potential GOP presidential candidates. That same poll indicated Clinton as the overwhelming favorite in a hypothetical Democratic primary. In the politically important state of Iowa, the first to kick off the presidential voting calendar, Clinton leads Bush 51% to 37%, according to a recent Quinnipiac University poll about voters' candidate preference in 2016. If black people cannot pass an easy test, make the required passing score lower as opposed to making black people smarter. That's the only solution. I don't understand the love for Reagan. The man should have been put on trial for treason. Raised the debt ceiling 18 times. I just don't get it. Republicans are the BIGGEST hypocrites. I am republican but I will NEVER vote republican again. Why would anyone be obligated to talk to Jeb, about anything? He's not holding any elected office, and as far as can be seen he never will again. Hispanic legislators propose a bill to increase the quota to Latino students to attend state universities regardless their academic failure in high school. The result will drive more unqualified college attend the universities, meanwhile to block those elite students who cannot go to the universities they want because of the Affirmative Action. I'm glad to know Jeb Bush ban such ridiculous regulation in FL. I don't care the last name of the candidates, Bush, Clinton, or Obama, only they devote to lead the country in the right direction. 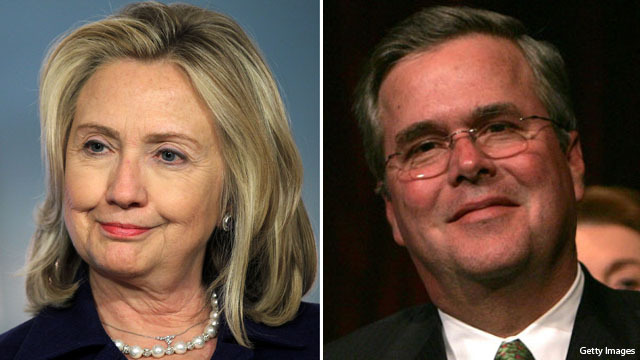 Working with Hillary will be the proverbial "kiss of death" for Jeb. At least that'll be how the GOtP nuts will see it. You are right, indeed both parties worship Reagan, he left the office with tremendous debts and none of the Republican says a word today. "Come 2016 I get the feeling that I might be back to voting for the lesser of two evils, not so much because I was inspired. I think you know of what I speak Dutch." I see eye to eye with you DM4O. Bush for pres and Hillary VP. I could vote for that. That's swell for you, robevh@hotmail.com, get out of the GOP–it doesn't need a nimrod like you. Globalization and post-secondary education is a vitally important topic. It's a shame that this is all people will ever hear about this conference.